Titanium Gr.5 Weld Neck Flanges, ANSI B16.5 Titanium Alloy Gr.5 Groove & Tongue Flanges, ASME B16.47 Welding Neck Flanges Suppling at France, Grade 5 Titanium Alloy SORF Flanges Dealer at UAE, Titanium Gr.5 High Hub Blind Flange, Titanium Gr.5 Spectacle Blind Flanges Supplier at Egypt, Ti Alloy Grade 5 Weldo / Nipo Flanges, Ti Alloy Grade 5 Expander Flanges Supplier & Exporter in Mumbai, India. Alpha Overseas is a prominent trader that offers Titanium Grade 5 Flanges, where high corrosion resistance is also a valuable characteristic. The usability of Titanium Grade 5 Pipe Flanges lies in its many benefits, which have extraordinary corrosion resistance and the ability to withstand extreme temperatures. Its poor shear strength makes Ti Gr 5 Flanges undesirable for bone screws or plates. 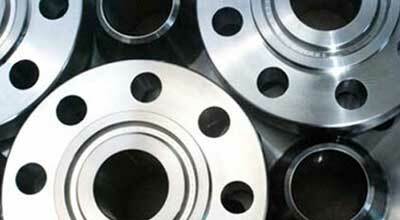 Ti Gr 5 Pipe Flanges is High Strength Titanium and Heat Treatable, which may be heat treated to increase its strength. The addition of 0.05 % palladium, 0.1 % ruthenium, 0.05 % palladium and 0.5% nickel in Grade 5 Titanium Flanges significantly increase corrosion resistance in reducing acid, sour and chloride environments, raising the threshold temperature for attack to well over 200 Degree C (392 Degree F). Grade 5 Titanium Pipe Flanges is an alpha-beta alloy, which has better response when heat treating to high strength levels. Titanium Alloy Gr.5 Flanges Manufacturer at Saudhi Arabia, DIN 3.7165 Titanium Blind Flanges, ASME SB564 Titanium Gr.5 Plate Flanges, Ti Alloy Grade 5 Slip On Flanges, ASTM B564 Titanium Gr.5 Flanges, UNS R56400 Pipe Flanges Exporter at Tanzania, Titanium Gr.5 Flanges, Ti Alloy Grade 5 Flanges Manufacturer & Stockist in India. Titanium Grade 5 Slip On Flanges is often used as a heat barrier because titanium stops the heat and does not transfer to the rest of the assembly. Titanium Grade 5 Weld Neck Flanges has excellent strength to weight ratio and higher strength at ambient temperatures than Grades 1 and 2. 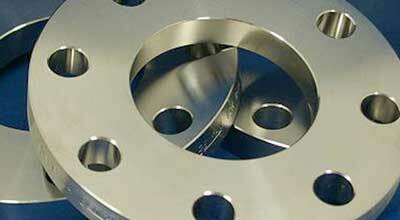 This biocompatible Titanium Grade 5 Blind Flanges is also well suited for medical implants. When visible to environment, Titanium Grade 5 Orifice Flanges makes a close - fitting and resolute oxide film which resists several corrosive resources, mainly salt water. Size : 1 / 2” to 18"
A Wide Range Of the Best Quality Titanium Gr.5 Flanges price list, Titanium Gr.5 Flanges, ASTM B564 Grade 5 Titanium Orifice Flange, B564 Titanium Gr.5 RTJ Flanges chemical composition, ASME SB564 Titanium alloy Grade 5 Screwed Flanges, Ti Alloy Grade 5 Pipe Flanges Price List, Ti Alloy Grade 5 Ring Type Joint Flanges manufacturers in india, Grade 5 Titanium Pipe Flanges dimensions, Ti Alloy Grade 5 Groove & Tongue Flanges price, ASTM B564 Titanium Alloy High Hub Blind Flange, Alloy Grade 5 Spectacle Blind Flanges, buy Titanium alloy Grade 5 Slip On Flanges, Top Quality Titanium Gr.5 Blind Flanges, ASTM B564, Special Ti Alloy Grade 5 Weldo / Nipo Flanges, High quality Grade 5 Titanium Alloy SORF Flanges, Titanium Gr.5 Socket Weld Flanges Manufacturer, Supplier in India. We are Exporter of Titanium Gr.5 Flanges in Worldwide Such as Spain, Nigeria, Oman, Singapore, Italy, Philippines, Slovakia, Algeria, Sri Lanka, India, Iraq, Macau, Saudi Arabia, Kenya, China, Gambia, Peru, Belgium, Tibet, Austria, Lebanon, Ecuador, United Kingdom, Chile, Sweden, Poland, South Korea, Indonesia, Australia, Croatia, Bangladesh, Hong Kong, Yemen, Mexico, Chile, Canada, Colombia, Afghanistan, Belarus, Brazil, France, Pakistan, Venezuela, Morocco, Namibia, Angola, Nepal, Lithuania, Bulgaria, United States, Kuwait, Finland, Qatar, Libya, Portugal, Malaysia, Russia, Puerto Rico, Mongolia, Vietnam, Hungary, Nigeria, Greece, Netherlands, Germany, Mexico, Thailand, Israel, Iran, Estonia, Egypt, Denmark, Bahrain, Norway, Jordan, Iran, Gabon, Bolivia, United Arab Emirates, Taiwan, New Zealand, Turkey, Japan, Romania, South Africa, Trinidad & Tobago,Tunisia, Ukraine, Poland, Ghana, Ireland, Serbia, Kazakhstan, Costa Rica, Czech Republic, Azerbaijan, Bhutan, Argentina, Switzerland, Zimbabwe. We are Suppliers of Titanium Gr.5 Pipe Flanges in India Such as Rajkot, Jamshedpur, Vadodara, Brisbane, Busan, Ho Chi Minh City, Sharjah, Nashik, Kuala Lumpur, Milan, Melbourne, Muscat, Chiyoda, Vung Tau, Dammam, Ernakulam, Jakarta, Mexico City, Madrid, Port-of-Spain, Moscow, Tehran, Los Angeles, Lahore, Indore, La Victoria, Granada, Perth, Hyderabad, Ludhiana, Jaipur, Colombo, Manama, Seoul, Howrah, New York, Pimpri-Chinchwad, Jeddah, Doha, Baroda, Nagpur, Algiers, Montreal, Bengaluru, Gimhae-si, Thane, Al Jubail, Al Khobar, London, Noida, Hanoi, Petaling Jaya, Geoje-si, Haryana, Cairo, Hong Kong, Bhopal, Atyrau, Mumbai, New Delhi, Rio de Janeiro, Faridabad, Singapore, Gurgaon, Chennai, Santiago, Pune, Istanbul, Ranchi, Secunderabad, Houston, Dallas, Riyadh, Sydney, Bogota, Edmonton, Aberdeen, Chandigarh, Lagos, Ahmedabad, Abu Dhabi, Karachi, Bangkok, Kuwait City, Thiruvananthapuram, Surat, Coimbatore, Caracas, Courbevoie, Ulsan, Kolkata, Dubai, Navi Mumbai, Ahvaz, Ankara, Toronto, Calgary, Visakhapatnam, Kanpur.